My American Pit Bull Terrier, Rocco, is a working boy. He is a certified therapy dog with Pets on Wheels of central Maryland. I got Rocco as a 13-week-old puppy that I found from an urgent post on Facebook. 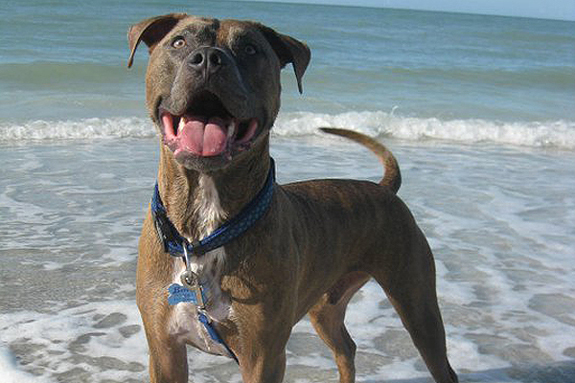 His whole litter was on death row slated for euthanasia just for being pit bulls. A rescue in Virginia pulled them from the shelter, and I adopted the scared puppy from them. He was so nervous at first that he would run from us. I enrolled him in eight months of classes from puppy classes through therapy dog training, and he came out of his shell and graduated with a certificate as a therapy dog. Rocco is now 1.5 years old and has been with Pets on Wheels since last fall. He visits nursing homes, colleges, military bases and a library where he works with kids. Every month he goes to the library for the Paws to Read program. 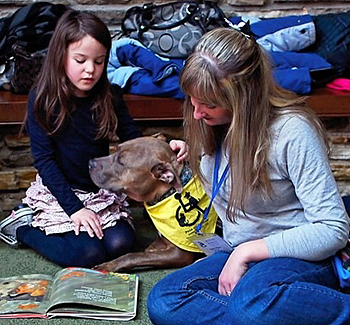 The kids read to him and their reading skills get better because they feel more comfortable reading to a dog versus reading in front of their peers at school. I have even had a couple of parents tell me that Rocco has helped their children to overcome their fear of dogs. He is mellow and gentle with them. Of course Rocco is a great breed spokesman. When people find out that their child is snuggling with a pit bull and they see first hand what a kind, gentle dog he is, it makes a great impression for people, many who have never seen any image of the breed other than the bad portrayal on the local news. I am certainly proud to have Rocco do this work and to help the community in any way that he can. Rocco is a great example of how a dog that was once in need of help can return the favor and greatly improve the lives of those around him. I live in Va and adopted my pitties from a VA resuce organziation. Where in Maryland do you reside and which rescue organization did you adopt Rocco? We actually live in southern Pa. His rescue is in Woodbridge Va. It’s called All 4 the Animals. A volunteer pulled Rocco and his 6 siblings out of the kill shelter in Stafford Va when they were 8 weeks old. Rocco looks just like our Gunther (we adopted him from a CT pound). They are about the same age as well. I wonder if Gunther could somehow be Rocco’s long lost brother?